This solution should probably be suggested whenever a student is encountering error messages or erratic behavior such as freezing of screens or loss of service such as dropping audio or video feed. Check to make sure that Adobe Flash is the most recent version. If you don't see these numbers, 23.0.0.162, in red, then go download the latest version and install it, otherwise go to step 2. This tutorial may become outdated. This page has the most up to date information at all times. Select one of the two versions of Flash Player to install. Internet Explorer download and install this one. All other supported browsers download and install this one. Test it to verify it is fixed and/or continue to step 2. Check the Adobe Connect Add-in version to be most current. Open up the adobe connect session that you use for one of your classes. 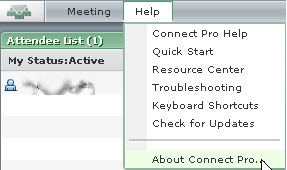 Click on "Help" then "About Connect Pro..."
On the very bottom of the window look for version 11.9.976.291. If the version matches the go to step 3. Uninstall the current version using Add remove programs. It is listed as "Adobe Connect Add-in". or manually download and install the latest version of the Adobe Connect Add-in. Test it to verify if it is fixed and/or continue to step 3. Check to see if a security application or firewall is interfering. This is the most difficult step to troubleshoot because there are various applications and a diversity of different settings for each. Most likely, any software title that has "Internet Security" in the title. Some home routers require port forwarding. Contact your Internet Service Provider if you need assistance to verify ports 80, 443, and 1935 are not blocked. The following ports are used by Adobe Connect: 80, 443, and 1935. Please ensure they are not being blocked by looking through the settings of your security application. This tutorial was edited on Sep 20, 2016.